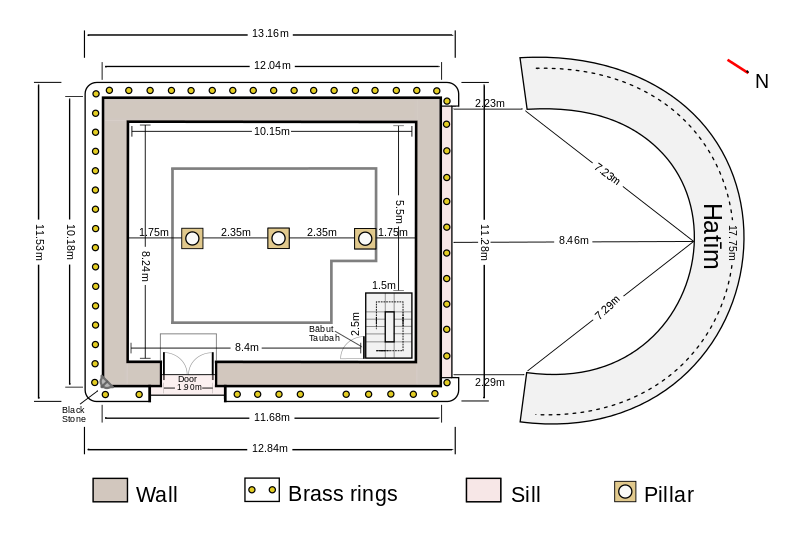 The Kaaba( also : Kaʿba ; DMG al-Kaʿba : cube‘) is a block-shaped building in the courtyard of the mosque (Masjid al-haram) in Mecca. It is considered the central sanctuary and the house of God (bayt Allāh). According to Islamic accounts and according to Sura 22/26 the Kaaba was built by Adam. But Adam lived far away and hardly had anything in mind with a Kaaba - not to mention the size of the Kaaba and Adam's tools at the time. Adams history is also an allegory. The interstate ruin was supposedly rebuilt by Abraham (Ibrāhīm) with the support of his son Ismael in the order of God as a place of pilgrimage. But Abraham was a poor man. When the worship of idols increased in Mecca, the image of the moon-god Hubal was placed in the Kaaba. Other tribes also added some 360 Djin gods in the mosque. The most popular deity was the female destiny goddess Manāt, who was also regarded as the wife of Hubal. A second popular goddess was al-'Uzzá, who is also mentioned in Qur'an Sura 53:19. 53:18. Verily, he had seen one of the greatest signs of his Lord. The Nabataeans equated her with the greek Aphrodite Ourania (Roman Venus Caelestis). Herodot saw (Histories I:131) Aphrodite as their equivalent : ' The Assyrians call Aphrodite Mylitta, the Arabs Alilat and the Persians Mithra '(the wife of Mithras, also worshiped as 'Sol Invictus' in Rome). The lunar deity Hubal was the chief god of the ruling Quraish tribe in Mecca over the 360 revered gods. Here the crescent has its origin, which is still found today on the minarets and roofs of every mosque. Hubal was famous for his seven arrow oracles. His image, made of red carnelian, stood in the Kaaba. Hubal was soon provided with human attributes and depicted with a shortened right arm without hand. The Quraysh replaced the missing hand with a golden hand. Hubal was also referred to as 'al ilah' (the god). The abridged version is 'Al lah'. In the arabic language the specific article is attached to the noun and forms the word 'allah'. The Islamic Allah, with his messenger Gabriel(Jibril), is, however, rather an attachment to the Jewish Merkaba, a precursor of the Kabbalah, in whose writings several Rabbies ascended to the heavens with their angels. Muhammad later destroyed the statue and the worship of the Manāt alongside Hubal together with Imam Ali. He also expelled the Jews in Medina, who did not wish to accept his Quran doctrine. The Kaaba (Image from Wikipedia Author Bjankuloski06en) is located in the courtyard of the Haram Mosque Masjid-ul-Haram in Mecca. Nowadays, the Kaaba is covered with a black bridge (Arabic: Kisua). In the eastern corner is a black meteorite. Otherwise, the Kaaba is empty except for three wooden pillars supporting the roof, and several gold and silver traffic lights hanging from the ceiling. The Kaaba was bombarded with fire during fighting in the Caliphate in 692, and 931 the Black Meteorite Stone (Arabic: Hadjar-ul-Aswad) was dragged off to Bahrain by sectarians (Ismai-Shi'ite Qarmates). It was not until 951 that the stone returned to Mecca, through the mediation of the Ismailite Fatimids. In 1630 the Turkish Sultan Murad IV ordered a new basalt building. In the chapter "The construction of Ka'ba by the Quraysh in the age of barbarism" (according to Peters), the Meccan historian at-Azi-aqi (d. 834 CF) collected some of the traditions that still affect the early appearance of the house Respectively.